The beautifully landscaped cabin and caravan park, situated at 264 Zeller Street Chinchilla, will provide all guests and visitors with a comfortable environment for a memorable and enjoyable stay. The cabins are of the highest quality and contain a king or queen bed as well as rooms that can sleep 4 people, 42 inch flat screen television, large refrigerator / freezer, Foxtel, free Wi-Fi, fully self contained kitchen with ceramic cook top and microwave oven. The ensuite is large with shower, vanity basin and toilet. Chinchilla Tourist Park with cabins and caravan sites is beautifully landscaped with tree lined streets and grassed areas. Chinchilla Tourist Park has an 100 seat dining room that is open for a full buffet breakfast from 5am and evening meals from 6pm. Lunch is available if required. The caravan park guests have 2 camp kitchens and 2amenities blocks for theuse of all guests. The camp kitchens have BBQ's and games areas. Laundries with coin operated machines are also provided. There is a large fully fenced swimming pool and pool area available for the use of all guests at Chinchilla Tourist Park. It is beautifully landscaped and has seating and tables to sit and relax. There is also a 3 acre parkland for walking or just sitting and relaxing at one of the seven picnic tables scattered through the park or overlooking the fully fenced dam where you can feed the fish. There is a Bbq area available to use as well. Caravaners are welcome to bring their pets or guests can stay in our pet friendly cabin. 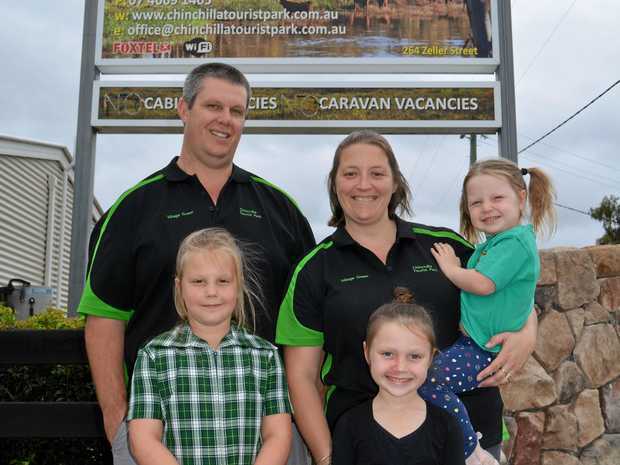 Chinchilla Tourist Park is situated on Zeller Street Chinchilla, 500 metres away from the Warrego Highway. The cabin and caravan park is only 5 minutes from the heart of Chinchilla and the RSL Club and hotels. Courtesy buses are available.